Stacy Tilton Reviews: Crayola for Everyone this holiday season! Crayola for Everyone this holiday season! I can remember when I was growing up that Crayola products were always on my list every year at Christmas. Even early on I liked to color, craft, and create. Fast forward to present day, I still like to do those things and I like to do them with my daughter. I'm really glad she inherited some of the same traits I have because it gives us a lot of fun things to do together. Fun things like designing fashionable outfits and stickers with these two awesome sets from Crayola. 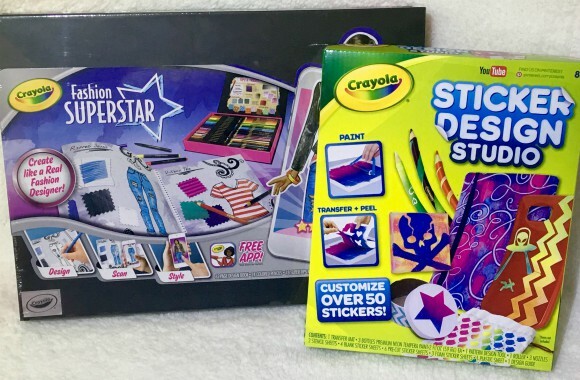 With the 62-page design book, 24 colored pencils, and 18 SuperTip Markers, young designers have all the colorful tools they need to create their own unique designs by hand with Crayola Fashion Superstar Designer. Use your style and creativity to design prints, patterns, and combinations that best express your personal taste. Personalize your world with the Sticker Design Studio. Paint and print art that you can use to decorate computers, lockers, book covers, and almost anything else. To use begin, just squeeze a small amount of the paint onto the clear gel mat and use the roller to blend the paint into a fun design. Once you’re done, put your art onto a sticker sheet to transfer your creation and let it dry. Each of the repositionable stickers, can be moved around whenever you’re ready for a fresh look. Just one of these sets alone gave us hours of entertainment. We took turns picking out colors for each other to use and made up challenges to use certain patterns or shapes when designing different pieces of apparel. I thought being able to upload your style creations to the app was the best part, it was neat seeing them come to life so to speak. Leave it to Crayola to make all my dreams come true too! I'm so in love with the new Crayola Signature line I honestly had trouble sharing them with my daughter when they arrived. She enjoys the kits that are geared towards her age, but is getting more and more into the adult coloring books like her mom. The book we received was so awesome, it featured different types of specialty papers to color and create on. I loved that it was different from any other adult type coloring book I had ever used. Paired up with the Crayola Signature Pencils I was in heaven all evening long! These colored pencils feature soft, highly-pigmented cores for smooth color laydown. The stylish matte black barrels have color-dipped ends for a sophisticated look. 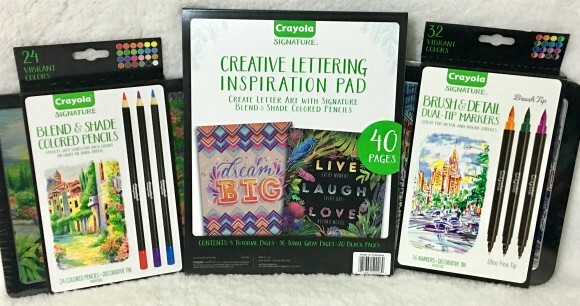 Vibrant on light and dark paper, these premium art tools are a wonderful choice for artists aged nine years and older. Learn to create eye-catching chalkboard lettering with the Creative Lettering Inspiration Pad. The activity pad includes black and grey specialty papers, tutorials, coloring and craft ideas to help you discover the fun of #Crayoligraphy. This pad pairs well with any of the Crayola Signature Pencils sets (sold separately). Signature Colored Pencils even appear bright on dark papers. Enhance cards, gift tags, table place cards, and more with this unique art tool to help you hand-letter in varying styles. Crayola Signature Brush & Detail Dual-Tip Markers provide twice the color and tip options for art and writing projects. Each marker features an ultra-fine tip and a brush tip for versatile laydowns and offers two vibrant hues for twice the colors.